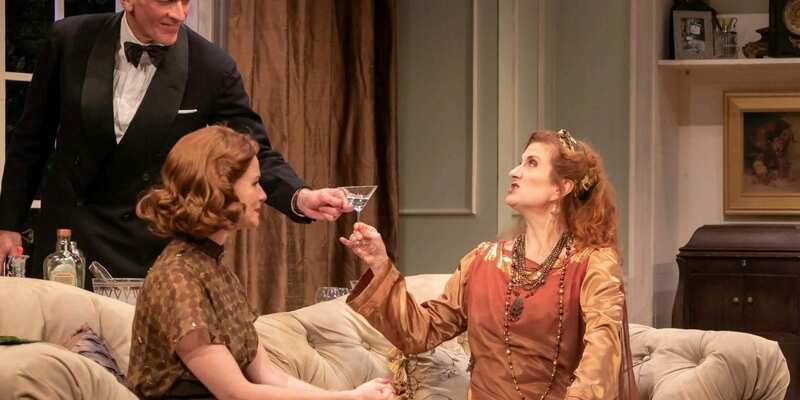 One of Noel Coward’s best-known plays, Blithe Spirit, which opened August 18 at the Shakespeare Theatre of New Jersey once again proves its lasting ability to appeal. 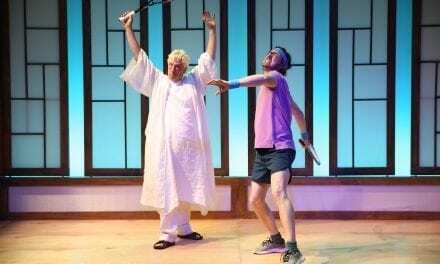 Directed by Victoria Mack, the production runs through September 2. Conceived during London’s 1941 Blitz and brought to the page in a six-day writing frenzy, this quirky, light-hearted comedy was meant to counteract the gloom overtaking the country as battlefield deaths mounted and nation collapse seemed quite possible. It became one of the West End’s longest running non-musical productions, with almost 2,000 performances. Charles, the husband of the story (played by Brent Harris), lives apparently quite happily with his wife Ruth (Kate MacCluggage) in that elegant, upperclass English drawing-room style . With unreliable assistance from their well-intentioned but inept maid Edith (Bethany Kay), they put on a dinner party, to which they invite their friends Dr. Bradman (Ames Anderson) and his wife (Monette Magrath). The party entertainment will be a séance conducted by a local spiritualist, Madame Arcati (Tina Stafford). The séance unexpectedly conjures the ghost of Charles’s first wife Elvira (Susan Maris), whom only Charles can see and hear. She interacts with him, though for everyone else, his reactions to her are inexplicable (too many martinis? ), and he tries to pass them off as a joke. The set, a model of the type, was designed by Charles Calvert; costumes (especially beautiful ones for Madame Arcati) were by Hugh Hanson; lighting trickery by Michael Giannitti; sound by Käri Berntson; and Alison Cote is production stage manager.